So that's it…had my last class for the year yesterday. I do have two more private classes and a downline event yet this month but it was the LAST posted class for the year, and it went swimmingly well. I love spending the day in our Happy Place with my stampers and it really warms my heart when I hear them exclaim…"it's SOOO stinkin' cute!" It WAS a long day as I held two sessions of my Giftables class and moment of confession…we celebrated Rob's Birthday this weekend, so all my cardstock wasn't cut and prepped. I pulled myself out of bed around 3:30am so I could finish cutting cardstock for class. Just couldn't swing it Sunday night. Left the party dishes and the cardstock for the morning and we all sat around the fire Sunday night…so good to be with family too. 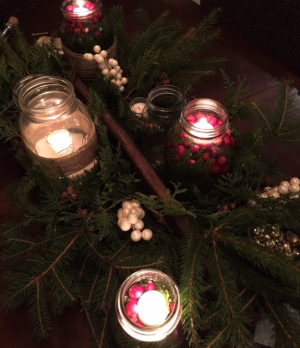 So I was bemoaning the fact the other day that I didn't have enough time to inspire you to fall in love with the rest of the Holiday catalog….So I best be using social media to it's fullest. 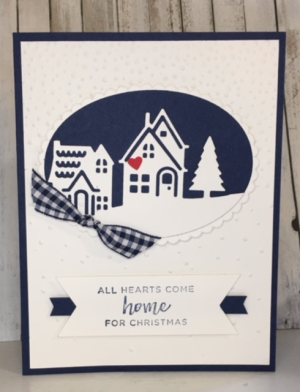 Here's another card that we did the other day for a class using the Hearts Come Home…You need this stamp set and framelit set. It's got to be one of my favorites! I mean, seriously…because who wouldn't want all the nestlings to come home for the Holidays! 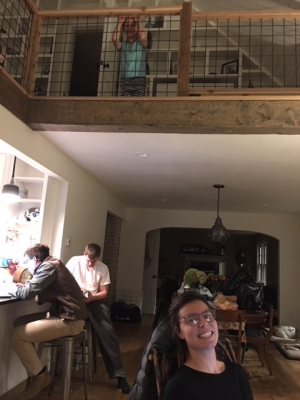 Ours were all home the other day…they mostly worked on homework but it was so comforting to have them all under one roof again…all hearts come home and all that. My littlest nestling is something else…honestly, she was a big help this weekend in helping with meal prep and decorating for the party/holidays. I think she knows her birthday is coming up and looking to get in my good graces! :) One of the perks of having a yard full of pine trees is an abundance of boughs, ready for the gathering…of course, we did need to harvest by flashlight…the days just aren't long enough.